Here is the dazzling saga of two women, the brilliant, bookish Elena and the fiery uncontainable Lila. In this book, life’s great discoveries have been made, its vagaries and losses have been suffered. Through it all, the women’s friendship, examined in its every detail over the course of four books, remains the gravitational center of their lives. Both women once fought to escape the neighborhood in which they grew up. Elena married, moved to Florence, started a family, and published several well-received books. But now, she has returned to Naples to be with the man she has always loved. Lila, on the other hand, never succeeded in freeing herself from Naples. She has become a successful entrepreneur, but her success draws her into closer proximity with the nepotism, chauvinism, and criminal violence that infect her neighborhood. Yet somehow this proximity to a world she has always rejected only brings her role as unacknowledged leader of that world into relief. Elena Ferrante was born in Naples. She is the author of The Days of Abandonment (Europa, 2005), Troubling Love (Europa, 2007), and The Lost Daughter (Europa, 2009). Her Neapolitan novels include My Brilliant Friend, The Story of a New Name, Those Who Leave and Those Who Stay, and the fourth and final book in the series, The Story of the Lost Child. Featured in the Wall Street Journal's list of "15 Books to Read This Fall"
Listed as one of Publisher Weekly's "Most Anticipated Books of Fall 2015"
Included in the Kirkus list of "21 Must-read Fall books"
Featured as one of the New York Times Book Review's "100 Notable Books of 2015"
"This is Ferrante at the height of her brilliance." "What words do you save? Here's your chance to bring them out, like the silver for the wedding of the first-born: genius, tour de force, masterpiece. 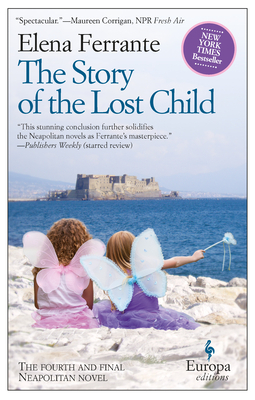 They apply to the work of Elena Ferrante, whose newly translated novel "The Story of the Lost Child" is the fourth and final one of her magnificent Neapolitan quartet, a sequence which now seems to me, at least within all that I've read, to be the greatest achievement in fiction of the post-war era." "The saga is both comfortingly traditional and radically fresh, it gives readers not just what they want, but something more than they didn't know they craved...through this fusion of high and low art, Ms. Ferrante emerges as a 21st-century Dickens." “Ferrante's accomplishment in these novels is to extract an enduring masterpiece from dissolving margins, from the commingling of self and other, creator and created, new and old, real and whatever the opposite of real may be. [...] Ferrante's voice is very much her own, but it's force is communal. Perhaps her quartet should be seen as one of the first great works of post-authorial literature." "Ferrante's Naples Quartet is anything but theater. It is the first genuine literary classic of the 21st century."